As you cycle among the ancient temples on your route from Mandalay to Bagan you'll also soon be impressed by the diversity of its people, culture, and topography which all make Burma one of the region’s most fascinating and beautiful countries. Our trip takes us from Kipling’s Mandalay on the imperious Irrawaddy River, to the temples at Bagan, before flying back to the capital, Yangon. We'll ride around Mandalay stopping at the famous 200-year-old teak U Bein bridge whilst greeting warm, friendly people. We visit the ancient city of Bagan and cycle amongst the pagodas, stupas, and temples dominating a river valley that once formed the centre of a great and deeply religious empire. The sunset view of Bagan's skyline is something you will truly never forget. On our way back through Yangon we visit the Shwedagon Paya, Burma’s holiest religious site, before heading to the airport for the flight home. 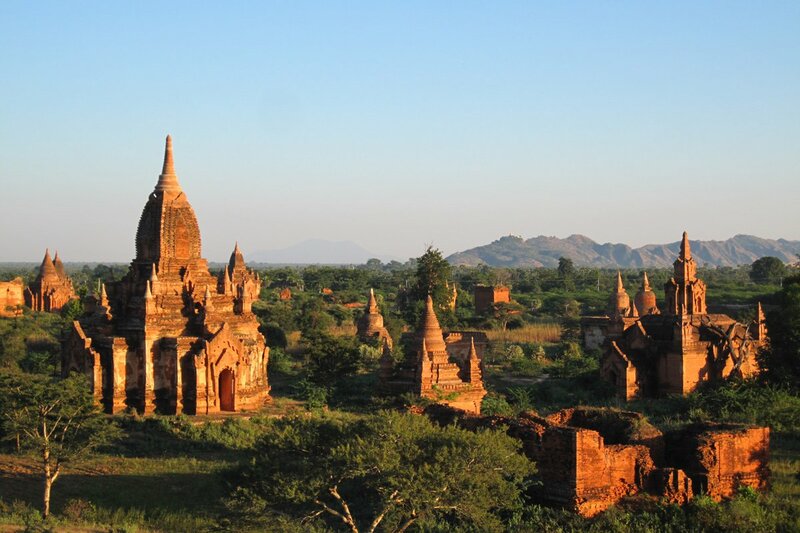 Due to the popularity of Burma as a destination we highly recommend booking early to guarantee your place on the tour. Bookings less than 30 days before departure run the risk of not being confirmed. Meet at our Mandalay hotel for a tour briefing and then drive up to the top of Mandalay Hill for sunset. We then go for dinner of traditional Burmese specialties. As we make our way towards Mingun, we stop at the famous 200-year-old teak U Bein Bridge. Our route follows the Irrawaddy all the way for plenty of photos ops. In Mingun, we visit the ruins of Pahtodawgyi and see the Mingun Bell. After lunch, a boat takes us downstream back to Mandalay. We transfer about an hour to Myin-Mu and start our ride to the remote town of Monywa. This is a pleasant ride on a tarmac road with little traffic as we cycle through the Chindwin Valley. From Monywa, we visit Po Win Taung Cave before transferring to our hotel. The scenery is varied, and the road good and flat as we ride along the Irrawaddy River. There are plenty of opportunities to interact with locals. After lunch in Pakkoku, we have a relaxing afternoon as we boat to Bagan. Bicycles are the perfect way to explore the temples of Bagan, which we do all day. The sunset, with views across the plains studded with chedis and temples, is something you will never forget. We transfer up to Mt Popa. Climb almost 900 stairs to the top of Popa Taung Kalat, passing dozens of shrines and pilgrims honouring the spirits. After the visit, begin biking downhill to Bagan through villages and quiet lanes. Fly back to Yangon. On arrival, visit Bogyoke Aung San Market before lunch at a local restaurant. In the afternoon, we visit Shwedagon Paya, Burma's holiest religious sight, before heading to the airport. Day 2 - Mandalay - Mingun - Mandalay Ride 44km. +335m / -249m. Our third SpiceRoads Trip and it was excellent. Friendly, helpful, knowledgeable guides and great support team. Overall, an excellent bicycle tour - great guides, great scenery and historical sites with a great group of similar minded riders. This ride was fun and educational. Guides Lin and Soe did any a wonderful job with just a diverse good of riders. Having a large group can be difficult for the leaders - though often more enjoyable to the riders - given there are more options in terms of speed and interests (easy to find some one to ride with). Very well organised bicycle tour. Eating at local restaurants is a positive feature. This is a touring trip for those who know biking can take you to the heart of a country. We ride 247 km on country lanes and quiet roads. There is little traffic, which makes for excellent bicycle touring. The first few days riding are on gentle rolling hills and through rice fields, ancient cities, and scenic countryside. Passing through many villages, you will find the people curious, friendly, and polite. We share the road with ox carts, cyclists, and waving children. There is an unbelievable amount to see throughout the tour, and we stop frequently to view temples, rural scenes (especially if riding during rice harvest), and villages. Suitability: This trip is a touring bike journey and suitable for anyone with a reasonable level of fitness. A support truck is always available to help when required. Inexperienced riders and even non-riding partners can be catered for and are more than welcome to join this tour. Biking Conditions: This tour covers around 247 km in 4 full cycling days and 1 half day. The roads can vary from being in quite good condition to broken tarmac, to vehicle-wide dirt trails. There is no technical riding on this trip, and the distances have been kept low to allow for plenty of time to visit sites and learn about the local culture. We start off our tour with a leisurely ride as we get used to our bicycles. Making our way towards Mingun, we stop at the famous 200-year-old teak U Bein Bridge. 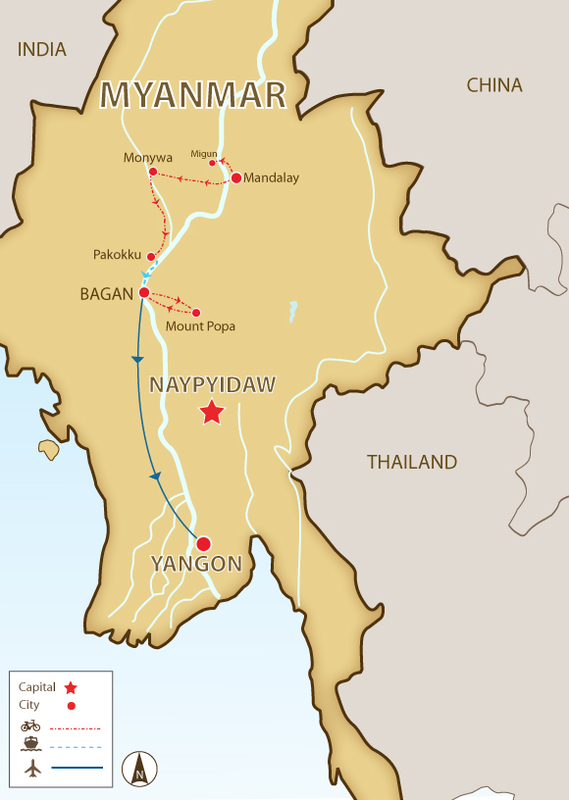 Our route follows the Irrawaddy all the way to Mingun, and there's little traffic on this undulating road. There'll be plenty of photos ops as we ride past more monasteries on this one road than on the entire rest of the trip. In Mingun, we visit the ruins of Pahtodawgyi, a massive unfinished stupa that would have been the largest in the world if completed and now might be the largest pile of bricks in the world, but is nonetheless impressive. We'll also see the Mingun Bell, which weighs 90 tonnes and is the largest ringing bell in the world. After lunch at a restaurant, we hop on a boat to take us downstream back to Mandalay and then pedal from the dock to the hotel. We meet up in the evening to drive to Mandalay Hill to enjoy another sunset before dinner. We start with a 3-hour transfer beyond the small town of Chaung-U. Once on the bikes, we cycle through the Chindwin Valley, where a variety of crops, from oranges to sugar cane, are grown. We take a break to visit Monywa's famous temple complex of Mohnyin Thambuddhei Paya, which dates back to 1303 and claims to house more than 500,000 Buddha images. After lunch at a local restaurant, we cross the Chindwin River by boat and continue cycling to Pho Win Taung Cave, famous for its carvings and mural paintings dating from the 14th and 18th centuries. Passing through several small farms and villages, you will have a glimpse of the traditional Burmese way of life. After visiting the cave, we return to Monywa and check-in to the hotel. We start from the hotel and hit dirt roads to take us south along the Irrawaddy River to Pakkoku. We pass through A Myint and A Neint, where you can spot ancient pagodas peeking out from the overgrowth. We stop to see some of the hidden temples decorated with murals as well as an old monastery. After lunch, we have a relaxing afternoon as we boat to Bagan. Once we dock, it's a short transfer to our hotel. Following the highway east, we transfer by bus up to Mt Popa. Popa soars 650 m up out of the plains, and the temple at the summit is populated by Burma’s most revered nats (spirits). As you climb the almost 900 stairs up to Popa Taung Kalat Temple, you will pass dozens of nat shrines and see pilgrims who come to honour the spirits. From the top, you will have a pano-rama of the surrounding plains. After your visit, begin biking downhill to Bagan. Along the way, we stop to enjoy a picnic box lunch in a village. The ride weaves through villages and quiet lanes as we make our way back to Bagan. Included in the tour are Trek mountain bikes with lightweight alloy frames, 24- to 27-speed gearing, disc/v-brakes, and Shimano components and front suspension. If you bring your own bike, please make sure it is a mountain bike, preferably with front suspension, in good mechanical order. A visa is required for all visitors to Burma. Please make sure your passport is valid for a minimum of 6 months beyond the duration of stay in Burma. Regulations are changing quickly, but at the moment the easiest method for those flying in is to obtain an e-visa for USD $50. The e-visa will be for a single-entry to international airports only (no land borders) and is valid for 28 days after entering the country. Apply online for the visa here and it takes one week to process (have a scanned copy of the first page of your passport and a digital photo ready). The approval letter must be printed as it will be needed to board international flights and needs to be submitted to immigration upon arrival. For those crossing at a land border (Bangkok to Yangon and Burma Road tours) you must go to your nearest Myanmar embassy to obtain a visa in advance. A list of embassies abroad is available here. Please click here for more information on visa requirements. Recommended vaccinations include typhoid, polio, tetanus and Hepatitis A. A certificate for Yellow Fever is required if arriving from an infected area within the prior six days. Some areas of Burma may be considered malarial areas. Please check with your doctor prior to departure for the most recent information. Myanmar has a tropical climate with fairly high humidity. There are three seasons: from March to June it is hot and dry, with temperatures between 27 and 40˚C, and with night temperatures in the 20s. The rainy season is from July to September, but temperatures are slightly lower, because of the effect of the rain. The cooler season (particularly in the mountains) is from September to February, with average temperatures between 20 and 30˚C. It will be much cooler at night in the hills in Shan state, where we spend 2 nights, and adequate cold weather clothing – gloves, hats, jacket – is advised. Meals are included as per the itinerary where B = breakfast, L = lunch, D = dinner. Most meals are local dishes and feature noodles, rice, curries and soups. Any special dietary requirements can also be catered for as well. Please let us know at the time of booking. Keeping you completely hydrated is a job we take very seriously. Cold water, some energy-restoring local fruit and soft drinks are included in the tour price. Beer is freely available everywhere, but is NOT included in the price. Burma’s everyday currency is the kyat. The kyat is used to cover buying small items, bottle of water or a snack, while dollars are used for everything else and the euro is also increasingly being accepted. The exchange rate in Yangon is generally better than upcountry and the larger the bill, the better the rate (ie- 100 USD notes receive 2% more kyat compared to 50 USD notes). Bring only newly issued USD currency (meaning the ones with the large off-centered portraits) without any tears or holes and avoid serial numbers beginning with CB. There have been widespread rumors that CB series notes are counterfeit. ATMs from CB Bank and KBZ Bank are available in Yangon and Mandalay. There is a 5000 kyat service fee and the maximum withdrawal is 300,000 kyats. Credit cards are only accepted in some upscale restaurants and some hotels do accept credit cards (surcharge of 3-8%) but it is not recommended to rely on this service as the Internet often shuts down during the day making payment by card impossible. Travelers Checks currently CANNOT be used or exchanged in Myanmar.